I would be remiss if I didn’t extend my quantum investigations to include some of this season’s festivities. Roger Highfield, author of the above mentioned Can Reindeer Fly? (or The Physics of Christmas, in the U.S.), assures us that there is really no aspect of the celebration which can not be adequately explained by a variety of scientific disciplines, including quantum gravity as an explanation for Santa’s extraordinary achievement each Christmas eve. Sean Smeltzer’s enchanting article in the New Scientist will certainly give you additional ammunition to get the little ones (and the not so little ones) to bed in time, and the following You Tube videos may seal the deal. A joyous season to you all! P.S. 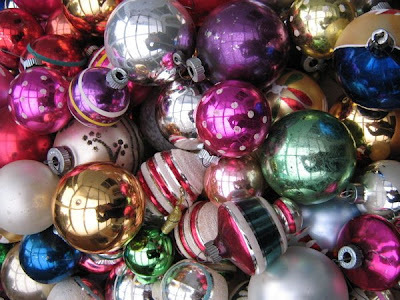 The antique Christmas ball collection pictured above is a treasure we enjoy unpacking each year. Many of the ornaments have been handed down from my partner’s family who, coincidentally are related to Knecht Ruprecht, Santa’s “assistant”. This entry was posted on Wednesday, January 30th, 2019 at 19:13	and is filed under For Peace. You can follow any responses to this entry through the RSS 2.0 feed.